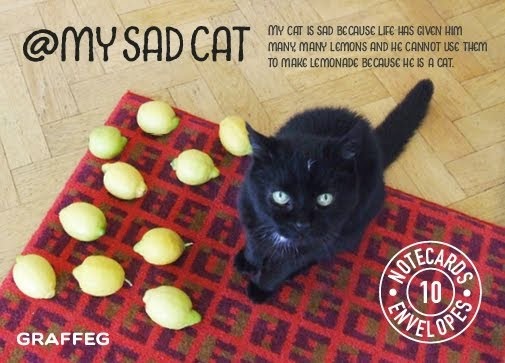 Who is @MYSADCAT and where can I find out more about him? @MYSADCAT is my seventeen and a half year-old cat, The Bear. He spends his days on the floors, bookshelves, chairs and freshly washed towels of my house here in Norfolk, UK, with three other cats of significantly lesser intellect: Ralph (tabby, narcissistic), Roscoe (black and white, bit like a living cartoon) and Shipley (black, gobshite). 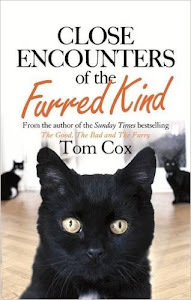 He is one of the stars - the star, many would argue - of my last two books, Under The Paw and Talk To The Tail, and my next one, The Good, The Bad And The Furry. The best to place to start reading his life story is Under The Paw. There is also a potted history of it of sorts in this This Guardian column. What made you set up the @MYSADCAT Twitter account? Everyone who meets The Bear in real life (and in Internet life) comments on the amazing soulfulness of his eyes, and he spends a lot of time following me around the house, looking directly into my own eyes, as if he has just heard about all the sadness in the world and is wondering what I can do about it. I had the idea quite a long while ago of a Twitter account where I listed all the things The Bear was sad about, but I prevaricated over it for various reasons - being shy about the idea of showing strangers bits of the inside of my house, respecting The Bear's privacy, not wanting to fritter away valuable writing time on the Internet. But then I changed my mind, and decided it would be quite fun, and creative, both comically and photographically. So many people had already responded to the melancholy and magic of The Bear's character after reading my books and asked to see him, I thought it would be nice to share him and that if it were up to him, he would probably have approved. After a fairly troubled early life, he'd probably be pleased to know he was being widely adored in his later years: the years when he has really come into his own, in terms of both looks and personality. How on earth have you managed to amass so many photos of him? I started taking a lot of photos of The Bear around New Year, when I began trying to get a new cover shot for my book to send to my new publishers, Little Brown. The paperbacks of my last two books, which came out via Simon And Schuster, feature posh actor kittens who I've never met, and don't really sum up the spirit of the books at all, which is something I wrote about here. By taking lots of shots of The Bear and starting the @MYSADCAT project I hoped I might be able to redress the balance, not only getting him on the cover of the new book, but perhaps eventually prompting my previous publishers to see sense - and the enormous love people have for his beautiful, somewhat human, face - and reissue Under The Paw and Talk To The Tail with him on the cover. On a personal level, having got an old, better quality camera working again, I wanted my own, half-decent photographic record of what an incredible, one-in-a-billion cat The Bear is, and what a great friend he's been, through thick and thin - something (albeit much, much more amateurishly) in the spirit of the wonderful book Ernie: A Photographer's Memoir by Tony Mendoza. That said, some of the photos - the one of him on top of his scratching post, in 2008, for example - are older. Does he mind you taking all those photos? He doesn't appear to. His habit of looking directly at me means he is also often looking directly at the camera, and he's very happy to pose. I don't stalk him with it all day. I don't want to piss him off, or keep waking him up from his many naps, so I take a series off different shots at times in the day when he's alert and friendly and I have a free moment or three. I do keep the camera handy, though, just in case I happen to find him doing any weird and mystical stuff, which he often does (see above scratching post incident). Why is the wallpaper in the background in the photos so old-looking and great? Because I chose it and I'm not bad in some ways, if you like those kind of people who do things like that. Why is the wallpaper in the background in the photos so old-looking and rubbish? I don't know. Why was your mum so convincing in her role as Chewbacca in the original Star Wars trilogy? Life is full of unanswerable questions. Are your opinions The Bear's opinions? Sometimes but definitely not always. We agree on a few things. We both like books. We're both fairly old-fashioned, and worried about the Americanisation of everyday British dialogue. But he's far more serious than me, with far less tolerance for low culture. He can't get on at all with the first Foreigner album, whereas I believe it to be a snobbishly overlooked classic rock masterpiece, and arguably the best album of 1977. I like comic fiction and big American novels, but he prefers magic realism and anything with a gothic element. We both love historical fiction and epic, wordy HBO TV dramas such as The Wire and Deadwood. The Bear is sad only in the sense that anyone of high intelligence is prone to melancholy and overanalysis. On every other level, he appears to be by far the happiest he's ever been in his life - sometimes in a very intense and clingy way. I suspect not moving house - an activity he likes even less than having a vet's thermometer up his bottom, the rigmarole of which he has been put through too many times - for almost nine years has helped. He was rather troubled, and not a little bit scheming, when I first met him, but over the years has mellowed, and would, I suspect, dearly like to be my only cat, so he could sit next to me for a large portion of every day, undisturbed by low lives and wannabes. No other cat I've ever known can purr for such sustained, lengthy periods and, because of his age, he does get a few more treats than the other cats who live here, though they're all spoilt rotten. Of course, he ultimately believes that the planet is on a fasttrack to oblivion, but that's a separate issue, which he is able to compartmentalise, and in terms of his own day to day existence, he's having a great time. Thanks a lot for sharing the stuff. I have a 17-year-old black cat named Otis. His eyes aren't as soulful as The Bear's, but in many other respects, especially the sustained purring and wish to be an only cat, they seem quite similar. I've very much enjoyed reading The Bear's Lamentations. I so enjoy seeing The Bear on twitter. I in a lot of ways can relate to his lamentations. I wish I found him sooner. I want to give him hugs and kisses. The Bear reminds me of my lovely little cat who lived for 22years, even had the same white heart. . . . Long live The Bear.